Following are issues that may occur when building projects with Flare. This error is a result of Flare not being able to write to a temporary file or directory. Following are several solutions that can fix the problem. Perform the following steps to clean your output files. Select the Project ribbon. In the Build section select Clean Project. A message displays, asking you to confirm the deletion of the Output folder and its files. For more information about cleaning projects, see Cleaning (Deleting) Output Files. Perform the following steps to delete the Users folder in the Flare project folder. Reopen the project in Flare and build the project. Uninstall Microsoft .NET Framework and reinstall the latest version. Check any anti-virus programs you may be running on your computer. Make sure that it allows Flare to write to temporary files and directories. Most of these types of programs have an exception list. Add Flare.exe to that list. 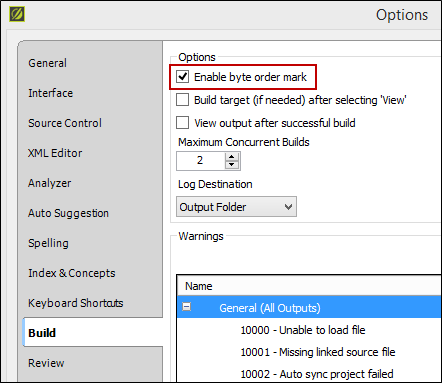 Byte Order Mark (BOM) is required for certain characters to be read. The error occurs because the registry has not turned on the BOM for the compiler when the project is being built. Turn on BOM using the Options dialog. This will enable BOM in your registry. 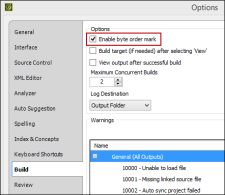 Click Enable byte order mark to add a check mark. Flare displays the following error when building a project. This is caused because Flare has run out of allocated memory. Reopen the project and build it. Save and close the project, then restart your computer. Open the project and build it. Consider dividing up your project into smaller projects. Delete the Analyzer folder from the Flare project.This will remove the corrupted Analyzer database. Flare will then generate a new database the next time that you open the project. Open the project in again Flare and build it. Use the command line to build the project. For steps on how to build the project in this manner, see Building Targets Using the Command Line.